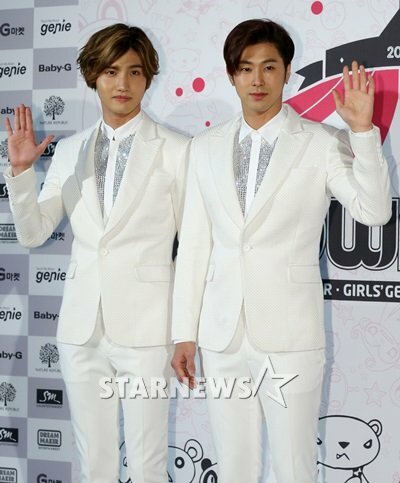 TVXQ (Max Changmin, U-Know Yunho) have made their comeback with the release of their 7th album ‘TENSE’, and the long line that formed at the Jongro branch of Kyobo Books drew the attention of everybody walking by. This branch of Kyobo Books was set to sell 200 limited edition copies of TVXQ’s CDs that were signed by the members themselves, and fans who heard the news flocked to the venue to stand in line. From people who had started lining up on the 5th, two days before the release, to people who had just gotten in line, it was truly a sight to see. The CDs contained just one signature from one of the two members, chosen at random. This element of mystery had the fans even more excited to get their hands on the CDs. 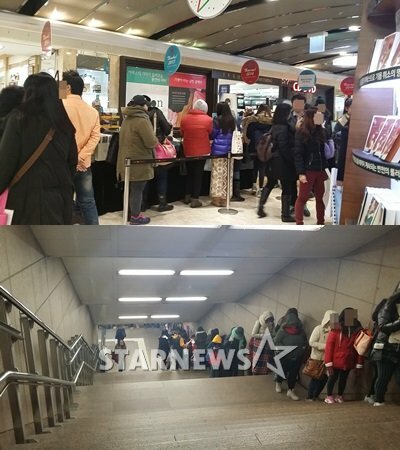 Hundreds of people lined up in front of the store, with the line winding down into Gwanghwamun Station. Fans who held numbered slips in their hands looked excited as they waited for their turn. One girl, who brought her parents along to buy two CDs and get both Max Changmin and U-Know Yunho’s signature, was unable to hide her happiness. International fans could be seen in line as well. Many of them were of Asian descent, coming from China and Japan. They, too, were unable to contain their happiness, shouting and screaming as they held their CDs. Some of them could be seen exchanging signed CDs with Korean fans. Though they didn’t speak the same language, they used gazes, hand gestures and movements to get their favorite member’s signature.